Ancora in rete Pak Kwang-Ryong nel pareggio per 1-1 tra Vaduz e Locarno. Posted in Senza categoria on aprile 18, 2014 by calciocorea. Con un comunicato sul suo sito, il Muanghotong United ha annunciato di aver rescisso il contratto con il capitano della nazionale della RPDC Ri Kwang-Chon. Il 28enne difensore centrale ha giocato due stagioni con la squadra tailandese, vincendo il campionato del 2012. Ri ritornerà quindi a giocare con il 25 Aprile. Settima ed ottava rete stagionale per l’attaccante del Vaduz nella gara vinta per 3-2 contro il Winterthur. Posted in Senza categoria on aprile 14, 2014 by calciocorea. L’Assemblea Popolare Suprema ha confermato Ri Jong-Mu al dicastero ministeriale per lo sport. Premiata la positiva politica dello sviluppo sportivo di questi ultimi anni. Posted in Senza categoria on aprile 10, 2014 by calciocorea. Supreme Commander of the Korean People’s Army Kim Jong Un, first secretary of the Workers’ Party of Korea and first chairman of the National Defence Commission of the DPRK, watched a women’s football match between the Kalmaegi team and the Jebi team together with service personnel of the KPA. When he appeared in the grandstand, the players and spectators enthusiastically welcomed him, giving profound thanks to him. The two teams fully displayed the football techniques which they have cultivated in their day-to-day trainings true to the WPK’s idea of building a sports power. The spectators warmly cheered with applause the footballers playing a nice game, displaying team spirit and persevering fighting will. The Kalmaegi team beat its rival 2:0. When the match was over, Kim Jong Un warmly acknowledged the enthusiastic cheers of the players and spectators and congratulated the footballers on their successful match. He gave precious instructions to bring the nation’s sports to a higher level by rounding off the Korean style sporting technique, tactical system and training method, noting that to develop the sports is important for successfully pushing forward the revolutionary struggle and construction and demonstrating before the whole world the dignity and honor of Songun Korea. Among the spectators were Choe Ryong Hae, Ri Yong Gil, Jang Jong Nam, So Hong Chan, Kim Su Gil, Kim Tong Hwa, Jo Kyong Chol, Kim Yong Chol, Ri Pyong Chol, Kim Myong Sik, Jang Tong Un, Pak Thae Su, Yun Jong Rin, Han Kwang Sang, Hwang Pyong So, Ri Jae Il, Pak Thae Song, Kim Sung Yon and executive members of the WPK Committee of the KPA and commanding officers of the services and corps-level units. Posted in Senza categoria on aprile 9, 2014 by calciocorea. Our Party’s plan is to make our country a sports power. To make it real, the Kanggye Juvenile Sports School is training more footballers who will make the country grow in glory and fame. Instructors of the school focus on raising basic football skill of the young players to keep with the trend of the world and putting education work on a more advanced scientific basis. Il Comandante Supremo dell’Esercito popolare coreano Kim Jong Un, primo segretario del Partito dei Lavoratori di Corea e primo presidente della Commissione nazionale di Difesa della Corea del Nord, ha assistito alla partita di calcio maschile tra la squadra Kalmagi e la squadra Jebi insieme con il funzionari di partito. Il team Jebi ha battuto la squadra Kalmagi 4 a 2. Il pubblico ha applaudito i giocatori che hanno mostrato pienamente le loro elevate tecniche di calcio, forte potere mentale e spirito testardo. Quando la partita è finita, Kim Jong Un si è congratulato con i giocatori per il successo, salutando calorosamente i giocatori e il pubblico. Ha poi esposto importanti compiti che serviranno da linee guida per il notevole sviluppo dello sport nel paese, dicendo che al fine di sviluppare lo sport è importante concentrare l’attenzione del pubblico sullo sport organizzando frequentemente partite di calcio e altri eventi sportivi. Tra il pubblico c’erano Ri Yong Gil, Jang Jong Nam, Pyon In Figlio, Kim Su Gil, O Kum Chol, n Kwang Chol, Jo Kyong Chol, Ri Pyong Chol, Kim Myong Sik, Jang Tong Un, Yun Jong Rin, Han Kwang Sang Hwang Pyong, Ri Jae Il, Pak Thae Song e Kim Sung Yon. 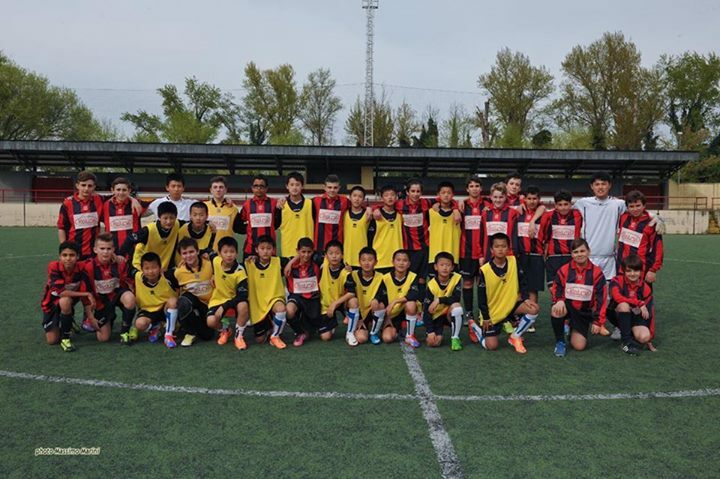 Posted in Senza categoria on aprile 8, 2014 by calciocorea. Posted in Senza categoria and tagged dpr korea league on aprile 7, 2014 by calciocorea.